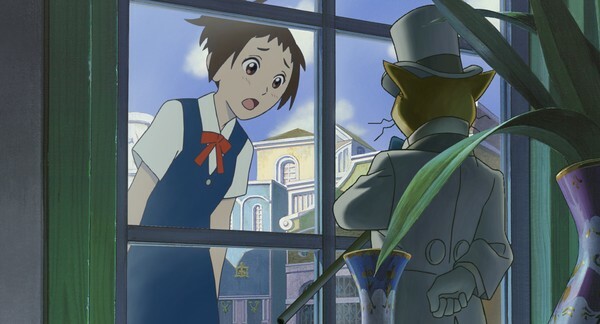 "The Cat Returns" is an animated drama film about a teen-aged girl named Haru. One day while she is walking home from school she spots a cat running around. Haru thinks nothing of the cat at first until she spots the cat crossing the road and then she saves the cat after he is nearly ran over by a truck. Shortly after that heroic moment she witnesses something she never expected to see in a million years and that was that the cat spoke to her and gave her his thanks and that she'll be rewarded. Later that night she is surprised as she spots a whole group of cats walking on their back legs carrying lanterns and carrying a big grey cat named The King of the Cats (but we'll just call him King Cat). King Cat gives Haru his thanks as the cat she saved ended up being his son and for her bravery King Cat is going to give her some gifts. The next day Haru wakes up only to think that her encounter with King Cat was all a dream but while at school she starts to receive a lot of unusual gifts and remembers that it wasn't a dream after all. Later that day she is visited by King Cat's number one servant who then tells her about what the King's biggest gift of all is... To be married to the Cat Prince and be part of the Royal Cat Family. Haru doesn't like that at all and she goes to find help to get herself out of her engagement. Will she succeed? Or will this be the end of her nine lives? (Click "Read More" to read the full review). I really liked this film's story and while it was short and simple it had a lot of flavor to it. 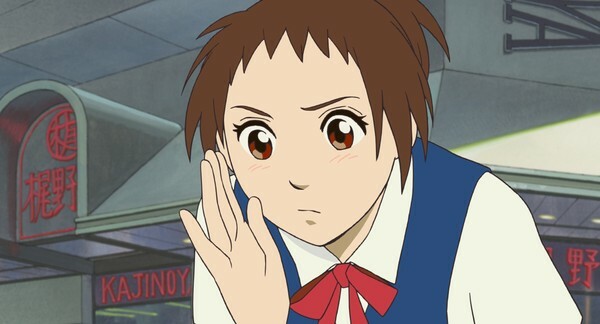 The setting was a bit typical as it is an animated film about a high school girl but it was done well in this case to where it didn't feel stereotypical. 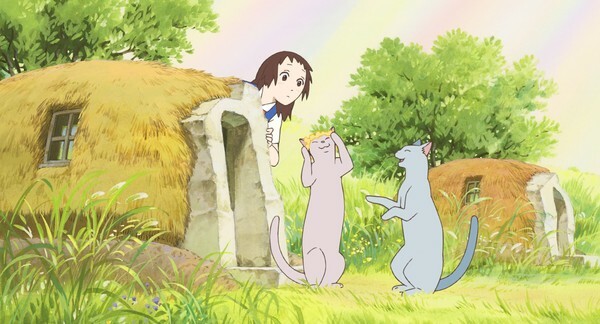 The whole idea with making the cats talk and have their own kingdom was also done well to where it wasn't too childish for adults to enjoy but still very safe for children to watch. The drama was decent but there were times where it was stock to where we have seen this been done before. The humor in this film was very charming and clever and it did put a smile on my face. The chase scenes in this film were a blast to watch as they were so fun and magical. The thing I like the most about this film was the characters as they were all charming and full of life and you'll find each character to be unique and enjoyable. The characters in this film is also a sad reminder that this will be (unintentionally mind you) the best "Cat in the Hat (1957)" film we will ever get that was shown in cinemas. The art-work in this film is very top-notch with beautiful real world inspired designs and a very imaginative look for the fantasy realms. The human characters were done well but you know what to expect if you saw any other film from Studio Ghibli as they use that same signature Ghibli look as all their other films. The cat characters had some basic designs but that was all that was needed to make them work as they capture the look and feeling of a lovable house cat. The animation in this film was really good and it will impress you in some scenes but it isn't perfect as there were some spots where it was a little rough like they skipped a few frames to rush this film out on time. The English dub in this film was really good with a voice cast full of stars like: Anne Hathaway ("Princess Diaries (2001)", "The Dark Knight Rises (2012)"), Peter Boyle ("Everybody Loves Raymond (1996 - 2005)", "Young Frankenstein (1974)"), and Tim Curry ("Rocky Horror Picture Show (1975)", "Loaded Weapon 1 (1993)") and they worked very well with some very solid acting that worked perfectly with the characters. The soundtrack in this film was very beautiful with a grand symphony playing some really nice tunes although some of them were forgettable. The song that played during the closing credits was really good with a nice relaxing vibe that made me feel like a cat resting in the sun without a care in the world. There are a decent amount of special features found on this blu-ray disc. The first feature is a P.I.P. mode (picture in picture mode) that has all the storyboards playing along side of the movie and it was very interesting to see all the beautiful sketches and was worth re-watching the film with that feature on. 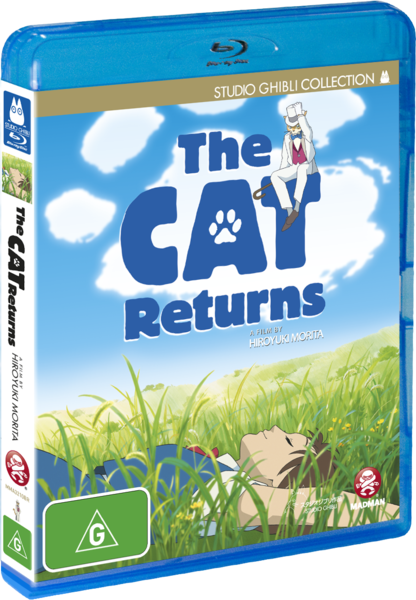 There are also two documentaries titled "The Making of The Cat Returns" and "Behind the Microphone". "The Making of The Cat Returns" is a detailed look on how the film was made on the Japanese side of production and it was quite interesting and entertaining to watch. "Behind the Microphone" gives you an in-depth look at the English side of production to where we see what it was like recording the English dub for the film and it was also interesting to watch. Last but not least you get all the theatrical trailer, promotional trailers, and television ads that were shown in Japan and they were alright but nothing really stood out so one viewing of each trailer was more than enough. One interesting thing about the trailers was that it also had a trailer to a mini film that played before this one and it was titled "Ghiblies Episode Two" and it would've been nice to have that as an extra as well but I'm also not surprised that it wasn't included. One bonus note that I would like to add is that while I was watching this film my two pet cats waltzed into the room and sat down and started watching the film with me. It was weird as I've never seen cats like mine sit down and keep their eyes on the screen for over an hour just watching TV. One of my cats did start to hiss at the TV when some of the cats in the film started to meow. I know that's a little weird to mention but I thought that'd be funny to share. Overall this was a pretty good film although as much as I praise this film I wouldn't say that this will end up being your favorite Studio Ghibli film of all time but you will enjoy this film nonetheless. This film also works really well on nights where you have the family over for movie night as they'll all love it. In the end I recommend this film for all to see. Fun viewing.